I'm saying hello from rainy England, and hoping to tap into this forum as a great resource of information and people. I'll start by saying that I don't own a Z car and never have although its been my dream classic for quite some time now. Ever since I saw the below linked video on Petrolicious (a couple of years ago now) I decided that I had to have a 240Z. I'm heavily into my MR2's with a 1996 gen3 JDM Turbo model which I've spent the last couple of years transforming my car from stock into a fast road car, and have loved every moment of it (most of the time :-D). This car continues to be used on a daily basis however I've been wanting to get into the classic/vintage car scene for a while with something of an older generation. Ever since I was a kid petrol has flowed through my veins with both me and my dad attending all sorts of car events and meets throughout my life, eventually getting my own hands on my own cars of which I am the current custodian. My dad runs a 1962 Austin Healey 3000 mk2a which inevitably got me into classic cars, we've both enjoyed that car for the last eight years and continue to enjoy it to this day, but I've decided its my turn to join the party so to speak. The 240z seems to be everything I want from a classic sports car with stunning looks, strong performance (for its age), reliability, JDM design etc. I've been saving money as and when possible, however we realized with the way values have gone that I'd need a helping hand to make the dream a reality, so we've decided to make it a father son project and go half's on budget. So what am I looking for? I'm being quite fussy but knowing the time, effort and money that we plan to devote to this project I want to get it just right. We're looking at mainly project cars so we can spec it to our preference, however if the right car came up then I wouldn't say no. The plan is to restore a car as a period styled racer albeit it will be mainly used as a road car. I'm not sure how many cars would have been produced to this spec, or for that matter how many are left like that however that's my starting point. I can compromise on colour (color) assuming the car needs a full respray however I would really like to find a series one matching no. 's car. I'm looking at West Coast cars and I've got a budget of $30,000 to purchase and restore the car to my spec car before arranging to have the car shipped back to the UK. So question time now to you guys, the experts. - How optimistic am I being with my requirements? - Is my budget reasonable? - Are there any contacts worth getting in touch with to help with my search? - Where should I be searching to find cars? I've been trying ebay, craigslist, zcartrader.com, hemmings albeit with limited success. Sorry for all the questions and info at once but would really appreciate all the help and info I can get! What do you mean with a period styled racer ? You said you want a matching numbers car. So you just want to upgrade the engine a bit, like for instande triple carburetors, or do more things ? 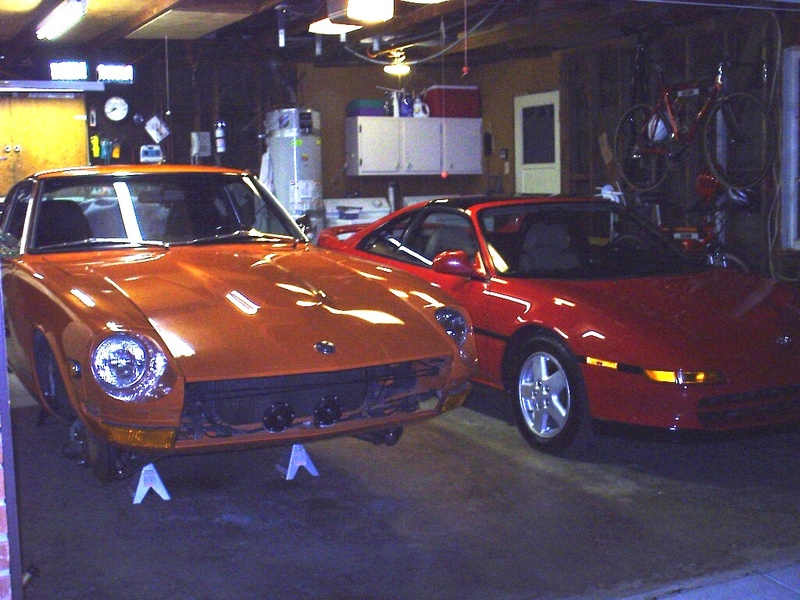 The first thing you should look for on a 240Z is an as much as possible rust free car. If you buy cheap you will need to invest more to get it back in good condition, so you would be looking at at price tag of around 15k or more. Here's an example ? Quite the list and budget. You should certainly be able to find a car and get it to your spec for 30k. Some things I may mention. If the car above is your direction, then I would suggest dropping the numbers matching or original engine requirement. That car has a Rebello stroked engine so it is not original. Also if you enjoy that look originality should not be a huge issue. Properly modified 240z's do not give up too much to original ones, as long as the mods are tasteful and done to a high level of quality. You should be able to find a really decent Z for 15-20k that has not be cut to pieces and is mostly 'there'. You want to find one that has not been cut up or modified too much as you want to have a known good 'start' point. As to where to look. Look at www.bringatrailer.com they have good deals on good cars from time to time. Also the absolute best place is local Z car clubs. I live in Texas and found a good clean Z car in North Carolina on a North Carolina Z car club. Look all the local chapters web sights and you can guarantee you will find a car or two loved by a knowledgeable owner. Also looking at the classified here is a good place. For 30k I would be tempted to sell you mine! Most of all, email me all you like about any questions you may have or want an opinion on any car you see. I am happy to help you find a project for you and your son. The Z to me was the perfect classic car. It had heritage, performance, reliability, affordable parts, and easy cost to get into. It has a timeless look and will always hold its value and sense of beauty. We are here to help and are glad to lend a hand! Man, I need some 15x8" wheels. Thank you all for the fast replies and fantastic responses! So when I say period style racer, to me that means how one of these would have looked if the owner had taken the car and tracked it in that period. I'm not talking full team sponsorship of anything, just how I imagine a privater would have turned up to a tack (this could be purely my fantasy though). In my mind I've got a BRE air dam, BRE spoiler, racing circle (vinyl in this case so its removable), centre exit twin exhaust, wing mounted bullet wing mirriors, clear headlight covers and racing wheels. I love watanabe wheels but they could be out of budget. Similarly styled in many respects to dave's car in the petrolicious video. Car would be colour coded factory orange with black detailing accents. Engine wise I want to remain true to the car, therefore keeping the L series engine and adding triple Webbers. What level of build I don't know, I've seen Rebello can take a L24 and claim to be able to take it to 270bhp with a triple carb setup, boring it out to a 2.7litre etc. In my mind I've got 230bhp ish as a starting point, I believe these engines are more about torque though which suits me as thats whats going to count on the road. Either way I'm after a car that will do 0-60 in six to seven seconds (closer to six the better), that can cruise nicely (guessing a five speed will be added) and most importantly is reliable. I'm not sure what sort of figures you would need to support the above performance requirements? I'm aware that the car in the petrolicious video has a Rebello build L28 bored out to a 3.1 rather than the stock L24, however I liked the idea matching numbers car as a heritage thing, and was thinking long term it could only help with value (not that I'm in this for the money). Whats the general advice with going from an L24 to an L28? I take it they perform better? do you think it will harm the value long term? Thanks for the ebay link and link to 'bring a trailer' (never heard of it before), the car on ebay certainly looks interesting! I'm glad everyone is saying the same message of watch for rust, rust and rust first. Everything else seems relatively straight forward. Have you got any links to any of the local Z clubs? I don't want to sound lazy, however using a UK search engine it always seems to prefer the UK websites! Are there websites for each region then? I really appreciate the offer Zedyone_Kenobi and will most likely take you up on your kind offer of asking questions and getting opinions on cars. Patcon thanks for the input, your thoughts were much the same as mine, I could see my budget melting away very quickly... That figure doesn't include returning the car to the UK, i have budgeted for that separately so it would be for purchasing and car and getting it worked on. Its good to have a rough idea of what to expect price wise to budget. What sort of respray would you expect for $7,000? I'm really thinking complete strip down to bear metal, cut out any rust and then complete respray. If needs be the budget could be stretched but thats my starting point an figure in my head, I'm very aware projects like this can have all kinds of surprises and extra costs. No problem, tell us about yourself. What is your age? Mechanical skill level. Amount of money you can put toward the car every month? Do you have a place to work on the car. What kind of work are you comfortable with. Do you have access to good mechanics/machine shops/body guys/upholstery shops? There are NO wrong answers to any of these questions, but it helps to know exactly what your situation is as well as your goals. All of this matters. Getting things done locally is always better as you can put 'eyes on' the project and you are in a position to dispute work done and approve what you like and ask for corrections for work not done well. It appears you are dead set on building up THAT exact car from the petrolicious video, which is great. It is good to have a vision, but keep in mind you can enjoy these cars in almost any guise. I wish you luck. Fuel to the fire, right hand drive too. ZCON 2016 is coming up soon. If you could get someone attending to look for cars for sale and set you up with some contact information that would be good. There was a few nice ones for sale at 2015's event. Offer a finders fee. I'm currently restoring the 1972 240Z pictured below. It is a rust-free car with 41,000 original miles and should be out of the paint shop soon. I am kicking around the idea of selling it when done. Ok so a bit more about me then, I'm currently 21 about to be 22. Mechanical wise all I know if what I've seen read and done to my MR2's over the past couple of years. I'm more than happy to have a go at most things where possible and have done things like brakes, suspension, servicing, replacing exhausts etc on my MR2. That being said I i usually defer to those more experienced for the more technical jobs when it comes to things such as engine work, body work and electrics. I wouldn't say I'm incompetent but certainly not a t a level where I could rebuild a car myself if that gives you an impression. The plan will be to have the car garaged on its return due to the climate, and I have plenty of driveway space if needed. Specialists wise there is a place called FourWays engineering just down the road, no more than 1 hour away who are one of the UK's leading Z specialists and can do all manner of work and I know another classic car specialist that can assist with everything that has recently purchased two 240z's themselves. Disposable wise I have anywhere between $700-1100 a month that I can spend on anything whether that be the car or anything else, so I'm not too worried about running costs, particularly when these will be split between my dad and myself. I have one Ace up my sleeve in that I have boos on the ground in San Francisco, which is where I plan to recover the car to in order that it can be worked on and restored to my taste. He will be able to inspect the works as they progress and feed information back to me. Siteunseen do you know anyone going to ZCON 2016? From a quick google it looks as though its being held in Canada? DatsunZGuy nice Z and MR2! The 240 is in the best colour (color) as well imo. Looks like a revision two MR2? Is it an NA or Turbo? looks to be in very clean original spec. Looks like you've got my ideal two cars sitting in your garage at the moment. I've attached a photo of my dads Healey with my MR2 last year, and an up to date photo of how the MR2 looks now. Long term I think the MR2 may go back to standard bodywork with a nice set of rims but can't decide. I've come across a car on craigslist that has peaked my interest. Its at the lower end of the budget end of the scale and will require a full respray imo but that's fine by me. To provide some extra info from the owner, due to the multitude of colours I asked for the reasons why. The car was originally orange, I've been told that the front right panel was hit by a tractor while the car was stored in a barn for 20 years. The headlight bucket and hood were both replaced (280z hood added at this point). No photos of the interior, I've been told minimal rust but without seeing can't say. I've also been told that the engine is not matching albeit I havent found out what it is yet. Obviously from your comments swapping the engine for an L28 for example wouldn't be the end of the world, however I still can't make my mind up on this point. So what are ou thoughts? I'm going to try and make some calls later today but what would you expect to pay for a full strip down and bare metal respray? as that appears at least in this case this would be essential and good to know for reference. Sorry for all the questions again. That Z may have been hit hard. If the car was originally orange (that appears true) then why is the right inner fender yellow? I don't see yellow anywhere else on the car. It appears that it was hit hard enough by the tractor that the inner fender had to be replaced. Did he mention that? Based on the color of the radiator support matching the right inner fender and the welds where it meets the radiator support I think the entire right front clip was replaced. Notice that he shows no pictures of where the left inner fender attaches to the radiator support. Are you planning on buying a car here in the colonies, and having it worked on and restored here and then shipping it, or are you planning on getting it to you and restoring it? I will add something else. Buy a car that be driven while you work on it. Being able to drive one is the fuel to the restoration fire. Having a non running car for years is true test of ones will, and as many of us can attest to here, life happens and priorities can quickly change. Thanks for taking the time to have a look chuck, these were the questions I asked and the responses I got are in bold. Would you say that this damage would be a show stopper so to speak if this was you? - I see from the pictures in your add that both the engine bay and boot shuts seem to be 918 orange with the rest of the car having been resprayed red and black at some point. Can you confirm that the car was 918 orange from factory? ORANGE IS ORIGINAL COLOR. CAR WAS HIT ON THE RIGHT FRONT PANEL AND APPEARS IT WAS REPLACED PRIOR TO MY ACQUISITION THUS THE YELLOW. I WANT TO DISCLOSE ALL. - What was the reason for the colour change/respray? (change of style? or was the car involved in an accident?) PRIOR OWNER PAINTED IT RED. CAR WAS IN A BARN FOR 20 YEARS AND TRACTOR BACKED INTO HOOD AND LEFT HEADLIGHT BUCKET? SPRAY PAINTED BUCKET AND REPLACED HOOD WITH A 280 THAT I SPRAY PAINTED BLACK. Sorry If I wasn't clearer, the plan is to purchase the car is the USA, most likely have it transported to San Francisco (owing to my contact) where the car will be restored before shipping the completed car to the UK that's ready to rock and roll. I don't necessarily need the car to be a runner when its acquired as the plan is to send it straight from purchase to local z specialists and/or workshops to have the car worked on and restored to my specification. Sorry, I may have skimmed over that. Okay, not doing the work all yourself will make things more expensive, and this leads me to the most important thing. Buy the BEST Z you can, even if it eats up ALL your budget. You can make more money. Buy a car that is just about 'done'. It will still be VERY much a project I promise you. I wouldn't let the replaced radiator support and inner fender be a show stopper but I'd want to see some pictures of where they were attached and get some measurements to make sure that the car is still "square". For $11k I'd probably keep looking. If you're going to buy a Z and then have a shop do work then you're best off to get a car already close to being what you want. It will most likely be much cheaper that way. The cost of labor will eat up your budget in a hurry. Thanks for the honest feedback chuck, I really appreciate that. In that case given that I can't easily inspect it myself I think I'l just have to pass it up and go for something that's more complete. Can anyone give me a rough ballpark figure on a full strip down and bare metal restoration? Well the point is that you can buy a Z that has already had a bare metal restoration (or close to it) for less than 30 probably. Here's another pence worth: give a bit of reconsideration to holding out for a Series 1. There will be a far greater number of cars to choose from if you open it up to the Series 2 cars - late 71's and after, i.e. higher yearly production quantities. The early cars came with the Type A transmission which had some weaknesses. Also, I've heard there were unibody structure improvements in the later cars. Others on this forum may be able to comment on that. A full respray for me here on the Southern East coast is some where between 5,000 and 9,000 depending on the shop and work load. I have a friend in the SF Bay Area looking to sell his 240Z. I believe it's an original 112 Yellow car although it needs a respray. The body looks to be in really good shape, I didn't see any rust during a quick inspection (doesn't mean there isn't any of course). It's a solid base car, although the fenders have been cut and flares installed. PM me if you're interested and I'll connect you guys. Thank you all for the further replies, this is all really helpful great info. From your comments I've spoken with my dad this evening (bearing in mind this is half his project) and we've decided to slightly narrow the search criteria looking at we we want to achieve form this project. With that in mind we don't want to compromise on a series one car, purely on the basis of that's where it all started design wise and is a bookmark for the vehicle and the colour is important to me suits the car so well so 918 orange will be the second sticking point. We're going to drop the matching no. 's requirement as a couple have rightly made the point that absolute originality isn't vital for this project. We will be searching or a near complete car with a lot of the work done as it gives a better starting platform to work from and also hopefully saves us a bit of cash which can be put towards mods and other bits. Hindsight is a wonderful thing, and I'm now slightly gutted that two months ago now I actually passed up on an opportunity to obtain the car I have just specified above which was rejected at the time due to a non standard engine. That being said it proves that with some patience and lots of trawling there are cars like this out there! Jim & Patcon thanks for the further info on the series one cars, that's really useful to know. The transmission weakness I'm less worried about as the plan will be to get a five speed transmission to go in there so that solves any potential issues there, however I'd like to know more about the potential for electrical gremlins and structural improvements? Would I notice a serious difference between a series one and two in that respect? Patcon thanks also for the respray figures, its nice to have a ball park figure in the back of my head in any event! That's correct. Feel free to PM me if you want more info although as I understand it may not be exactly what you're looking for.